The flowers of Red Grace can easily grow to about 20 cm wide and are packed so full of petals that they form into a perfect round ball after blooming. Therefore Paeonia Red Grace is one of the peonies with the largest flowers that we carry in our assortment. Red Grace is an early blooming hybrid, full-petalled and bright red. The bud can grow to about 60 mm wide. Red Grace has a lot in common with Red Charm, but is bigger in size. Unfortunately, this exclusive peony variety is very hard to obtain. This peony was bred in 1955 by Glasscock and registered in 1980 by Charles Klehm. 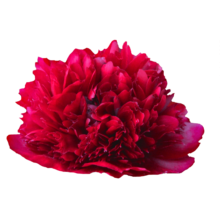 In full bloom, Red Grace is one of the biggest and most perfect shaped peonies on the market. Cut it when the bud is showing colour, otherwise Red Grace will not reach its full potential. When cut at the right stage of maturity, Red Grace will have a longer vase life than Red Charm.